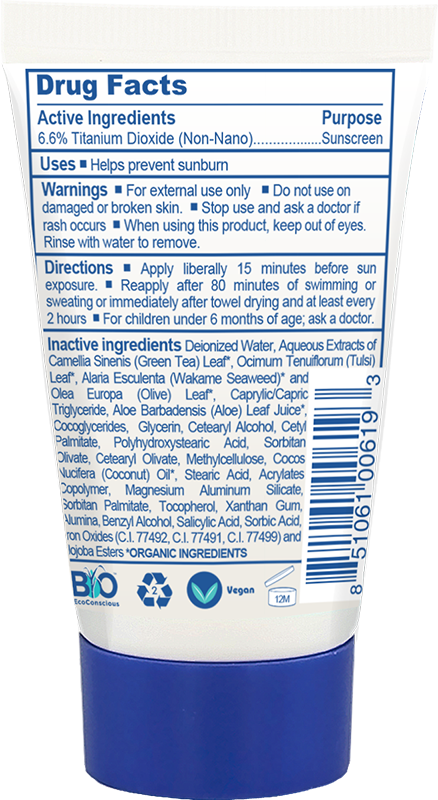 Certain ingredients commonly used in sunscreens, cosmetics, and soaps are highly toxic to corals and marine life. These include benzophenones, oxybenzone, octinoxate, and parabens – as well as coatings used on zinc oxide to reduce whitening. When these chemicals are introduced to Bonaire’s waters, the coral can become stressed and expel their symbiotic algae. Without these algae, the coral can “bleach” (turn white) and may even die. This, in turn, affects all species of fish who rely on the coral reefs. When these populations decline, the effects are quickly noted. It might appear that the ocean is so huge, and we are just one drop in the big bucket of the oceans. Unfortunately, even the most minute “drop” can cause extensive damage to the reef. Bonaire’s island government has joined in with Hawaii and other resort destinations to impose a ban on chemical sunscreens containing these harmful ingredients by January 1, 2021. However, the sooner that users of Bonaire’s marine park start switching over to safer mineral sunscreens, the happier Bonaire’s reefs will be. Everything you need to know about sunscreen ingredients, but were afraid to ask! Start with a smaller amount than usual. Apply in sections, and rub in well. As long as you can see it, it’s working! Some prefer to apply to moisturized or damp skin. Ingredients in shampoos and other body care products also impact our waters! Stream2Sea offers a full line formulated without any ingredients with known aquatic toxicity. All products are readily biodegradable and are proven to have minimal impact on marine ecosystems. 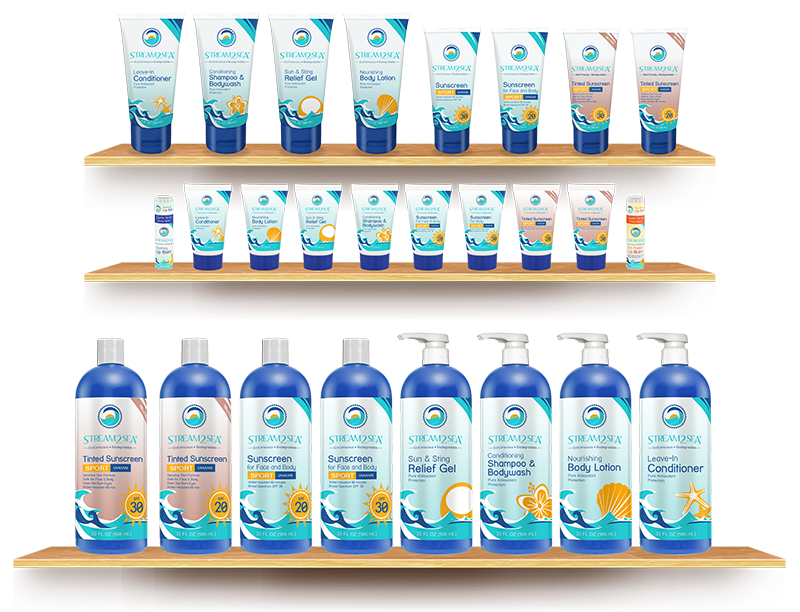 Choose from shampoo and body wash, conditioner, body lotion, lip balm, or sun and sting relief gel. 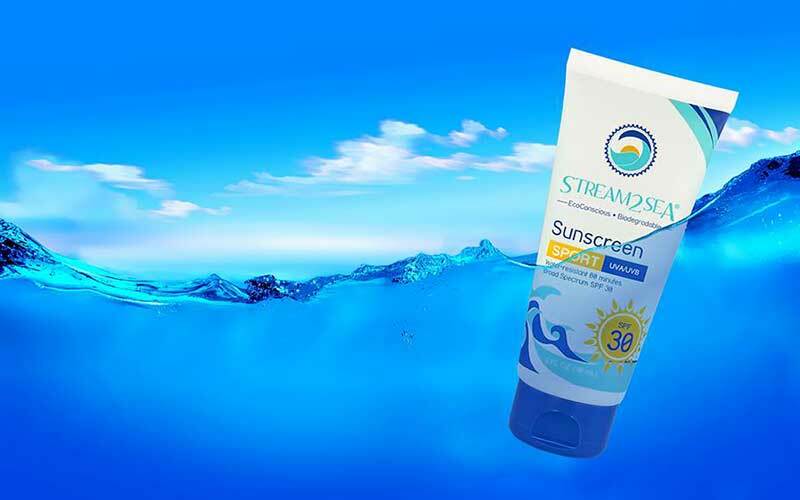 All Stream2Sea products (except lip balms) utilize tubes made from sugarcane pulp after the sugar juices have been expelled. This pulp was once treated as a waste product and burned, but now is utilized as a valuable product which reduces our greenhouse emissions. The pulp is then fermented and distilled, producing ethanol. The ethanol is then dehydrated to create ethylene, which is then converted into polyethylene, a bio-based material. This material is identical to traditional petrochemical-based plastics in every way, except for the carbon footprint that went into making it! The texture, durability, weight, appearance and shelf life are exactly the same. When you choose product-packaging made with sugarcane resin rather than plastic, you are helping to take steps to decrease our carbon footprint and reduce plastic processing waste.